We arrived late at night to Christchurch, New Zealand not sure what to expect. Usually, when going through immigration, the foreign passport holder line is packed with people. Tonight this was not the case. Our half empty flight from Melbourne contained Native New Zealanders coming home to see their loved ones, emergency workers coming in to help with the relief efforts and us. Stepping out of the arrivals area, we were surprised to see several groups of people camped out in the terminal waiting for flights to leave the country. We didn’t realize that people were still trying to leave town this long after the earthquake struck. Our taxi driver told us that he read as many as 4000 people per day were leaving Christchurch. 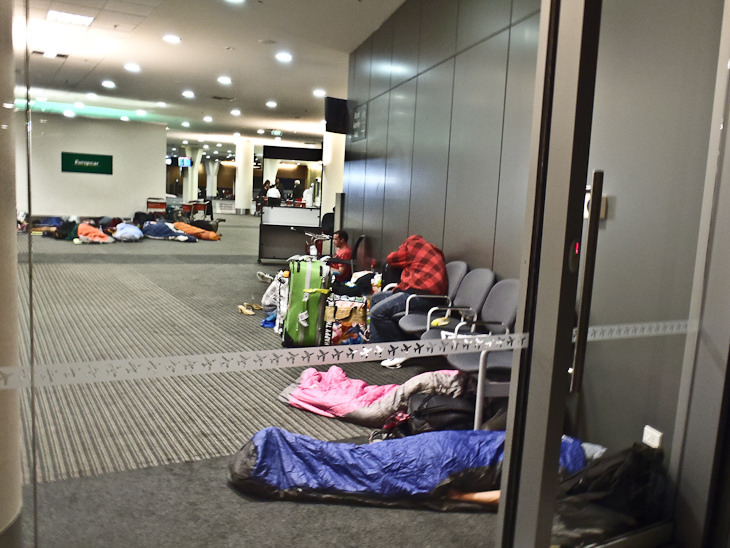 We wondered how bad things must be if people are sleeping on the floor of the airport trying to flee the country. Driving into the city centre was an eerie feeling. 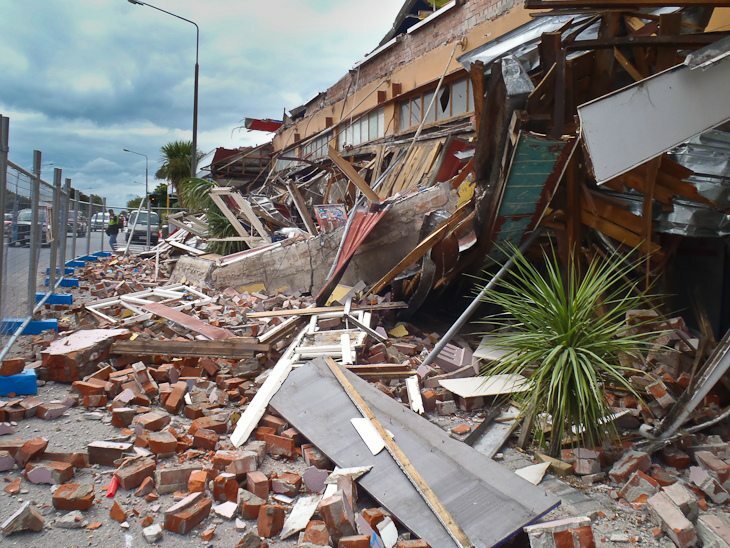 Much of Christchurch is without power and as we looked out our window we could see the destruction of the devastating earthquake that struck just a few days earlier. Buildings are crumbled, roads are buckled and military forces guard the main emergency area that is off limits to anyone trying to enter. We drove over what appeared to be a large speed bump, but then realized that it was a crack in the road that came apart during the deadly quake. Christchurch is in a state of emergency. As our driver stated, it looks like a war zone. Yellow emergency tape is strung across intersections with tanks and police standing guard to make sure nobody enters. A curfew is in place and residents living within the area are not allowed out of their homes after dark. We aren’t the type to run towards natural disasters or emergency zones. 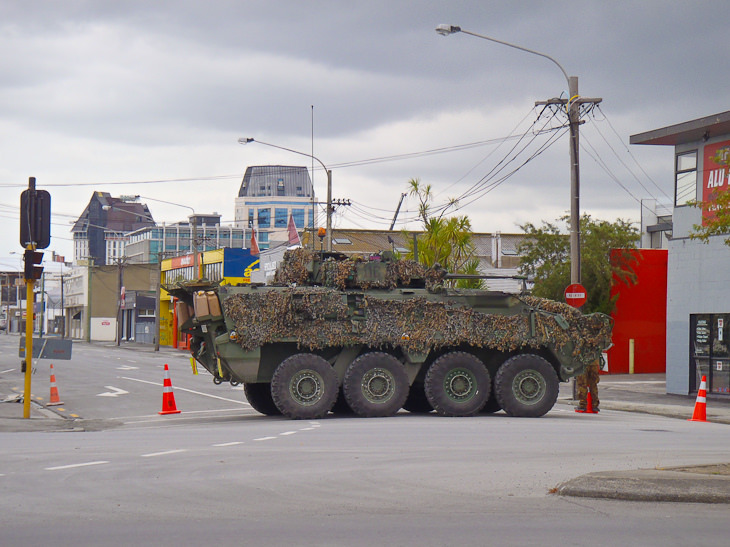 Our trip to Christchurch was planned before the earthquake happened. We tried to make alternative plans to fly in at a later date or to a different part of the country, but almost everyone else was trying to do the same thing and we were forced to continue on with our plans. In three days we will be continuing on from here to start our tour of the North and South Islands but for now, we are in the middle of a city trying to recover from a terrible tragedy. Christchurch has hundreds of search and rescue specialists coming into the country and they have a very organized rescue operation in place. We have not come with grand delusions of helping. Emergency workers are in the destruction zone doing their job and if anyone tries to enter the area, they will be arrested. People without skill can end up doing more harm than good. No we are simply here because it was on our travel plans to come here. Our original hotel was located right in the epicenter of the disaster zone that is off limits to everyone. Originally we read that it was being used to house emergency workers, but now we think that it must be evacuated as it is right next to The Grand Chancellor Hotel that is about to collapse. We had to make alternative arrangements for another place to stay and found a hostel that is still open just beyond the no entry zone. The Old Country House on Gloucester Street is open and has power. We are so close to the emergency zone that our taxi driver had to find an alternative route to take us in as the road leading to it is sectioned off and guarded by military. He stated that the aftershocks are what is the most unsettling and it was only a few minutes after entering our room that we felt our first tremor. We have never been in an earthquake before and this aftershock seemed quite large to us. Our room shook for a few seconds and we looked at each other and realized what just happened. We were awakened two more times throughout the night by some milder aftershocks but soon the jet lag took it’s toll and we fell to sleep undisturbed for the rest of the night. It is going to be a difficult time for the people of Christchurch. Tourism is a large part of their economy and people are always scared off by a natural disaster. Now that it has been struck twice in the same place, we wonder how long it will be before tourists make their way back and how many residents will seek out a new home. It is now morning and we hear laughter in the hallway. Today, we are going to venture out and have a look at the city, hook up our iPhone so our families can connect with us if they are worried and we are going to see if we can get in touch with some friends that live here. 18 Responses to "The Aftermath and Aftershocks in Christchurch"
Wow, that really leaves a big hole in my stomach hearing about that, how terrible, i hope everyone is allright out there. i give them my love. Wow. I live in Christchurch and all of the aftershock keep you feeling on edge. Many people have been terrific through this whole ordeal, however for some people it is just too much. I love Christchurch as a city. Just like to say thanks for all the kind thoughts and to all those involved from overseas and local. Your support has been tremendious. Other countries sending help has been awesome. Students and contractors volunteering their time. Just amazing. Well looks like I will have to remain on edge for sometime yet as these aftershocks just don’t seem to want to stop. Wow!!! Can’t believe you guys had to go there anyway. We are in Rotorua and are meeting someone every day who has either gotten out and fled to calmer towns or who has family affected by the earthquake. Stay safe and enjoy the rest of your travels in NZ on firmer ground. I didn’t know you were in New Zealand. we will get in touch with you when we arrive at Rotorua. We move on today. Hey, I think it’s amazing that you decided to continue on with your trip, good for you! It will be interesting to read more about your impressions of NZ and the areas affected by the earthquake as you travel. Have a safe visit! Thanks David. We leave Christchurch today, but it will be interesting coming back in a month to see how things progress. They have years of rebuilding ahead of them. Christchurch is a wonderful city and you should definitely return when it gets back on its feet. If you are looking ideas for places to visit around the Canterbury region I can recommend the town of Akaroa – a beautiful town about an hour’s drive from Christchurch. Thanks for the recommendation Mike. We will check it out when we come back to Christchurch next month. Such a devastating thing to happen. I feel for the people of Christchurch. Take care while you are there and I hope you enjoy the rest of your trip. Hey guys, I am happy you came. Not only because I’m finally about to meet you (what am I doing on the computer? I should be in the kitchen preparing our dinner!) but because I think it is important for the world to see that not only you can still come to Christchurch but also understand how important it is for tourists to keep on coming. We have had customers yesterday that said the decided to continue with the plan to come here because it is obvious to them the city needs you. I hope that when you return in a month time we will be able to show you some of the places this city is so famous for. Hi Dave and Deb, I had forgotten you had plans to go to NZ. I’m glad you found a place to stay that has power. I’ve heard so many good things about the country so I’m sure you will have a great time anyway. Wow I´d love to see more photos. I´ve been following it a bit but had no idea things were so terrible. Deb and Dave, I think it is great that you decided to go to Christchurch anyway. You are the pioneers in bringing tourism back to the area. People follow your blog and your adventures and when they see what you have to say, I am sure it will give them more information about choosing Christchurch as a destination or not. People trust you and know you will give us the best and most accurate info about the area. Who knows you may even inspire us to go to New Zealand. After all you are Canada’a Adventure Couple! Be safe and enjoy your travels! Thank you so much for you account on what the city is like right now. I was actualy traveling around South America but have changed my plans in order to fly to Christchurch and give a very good friend some help. I managed to get a flight for Tuesday and although I’ve been updated with the situation there all the time, it was really good to read your report (coming from people who have just arrived there). It’s a terrible shame that you didn’t get to see it before, such a gorgeous city but I do hope you can enjoy the rest of trip around New Zealand (it’s one of my favorite countries in the world). Being a Kiwi myself, though one that has “flown” far from home, it is pretty rough seeing this reality. I mean a tank in the middle of the street? Was it hard to find a place to stay? I’m sure that once you are out and about doing your “thang”, your promotion of NZ via this blog will help people see that the country is a place worth visiting and not shunning. Wow guys! Those poor people…it really brings a multitude of emotions to you, i would imagine. Hopefully they can recover relatively quickly and put their lives back together.